The new DS 7 Crossback is a rather fine-looking SUV that delivers a comfortable ride in its sumptuous cabin. What’s more, this large family car is exceedingly spacious and comes very well-equipped. The elegantly muscular DS 7 Crossback boasts a number of eye-catching exterior fixtures. For instance, the car’s door mirrors are housed in gloss-black casings, and its front radiator grille is finished in black too. The vehicle rides on 18-inch diamond-cut alloy wheels as standard, each of which is adorned with a black centre cap that is emblazoned with the DS emblem. The practical Crossback also features a power-operated tailgate, making access to the boot as simple as possible. Among the vehicle’s range of exterior lighting are LED daytime running lights, LED front fog lamps and 3D tail lights, all producing a striking light signature. Inside, the five-seat DS 7 Crossback provides plenty of room for travellers in each compartment. The cabin is replete with soft-touch materials, including quilted-leather seats – and leather is used to wrap the vehicle’s steering wheel and gear knob too. A 555-lite boot space should be more than adequate to meet the demands of a weekly visit to the supermarket, or a trip to the airport loaded with suitcases. However, if more luggage capacity is required, simply fold the rear seats to produce a 1,752-litre load space. 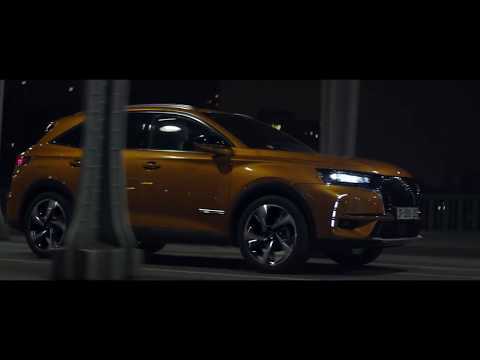 The new DS 7 Crossback is powered by one of three engine options. A 1.6-litre 221bhp petrol unit produces 300Nm of torque and 0-60mph in a little over eight seconds. It also manages a very creditable 57.9mpg(combined) figure, and CO2emissions from 135g/km. Optimal fuel-efficiency is delivered by a 1.5-litre 128bhp diesel engine, which returns as much as 68.9mpg, while producing emissions as low as 107g/km. A 2.0-litre 178bhp diesel unit is available too, which provides a peak torque of 400Nm, and 0-60mph in less than ten seconds. A standard-issue eight-inch display screen enables easy access to the car’s eight-speaker sound system, which features DAB digital radio, among other things. Bluetooth connectivity features too, facilitating music streaming and hands-free mobile communication. What’s more, your smartphone can be mirrored via the Crossback’s touchscreen, thanks to the inclusion of Apple CarPlay and Android Auto.